NOTES BY NORSE: Santa Ana–a City that was the focus on extensive legal action on behalf of the homeless 25 years ago– has transformed a retrofitted bus terminal downtown into a 24-hour homeless shelter serving hundreds of people. Criticisms by those upset by the overcrowding, harsh treatment, and favoritism are chronicled below in these Voice of Orange County articles (see also the links in the story below). However apparently legal pressure and the (now unlikely) prospect of federal intervention (as happened in the Bell v. Boise case) did prompt a massive if typically off-target expenditure to open up what may be the largest shelter on the West Coast. Santa Cruz, in contrast, has essentially eliminated year-round shelter services at its Homeless (Lack of) Services Center. Gone areboth the emergency shelter element (which was never more than 50 spaces) & the free meal aspect (shut down completely after June 2015)–actions that prompted the ongoing Freedom Sleeper demonstrations at City Hall. Fences, security guards, and ID cards have replaced the open campus practices of past years–apparently as a sop to NIMBY locals in the Harvey West Neighborhood Association and bigoted community groups like Take Back Santa Cruz. Disabled and ill clients have been literally thrown out on the street–to be subsequently hospitalized like Andy Carcero. Others have periodically set up protest campsites outside demanding fair treatment. Mainstream and “alternative” media, unlike Orange County media, have paid no attention to the abuses at Coral Street and its slow steady descent into a prison-like posture. And for the thousands outside without even the possibility of shelter City Council throws money at police, rangers, and security thugs to “move along” disabled folks out into the rain from under the eaves of buildings. When will the simple realities of the presence of homeless people on the streets finally force authorities to abandon police-state tactics in favor of real resources? No time soon, I fear, without street and legal pressure. Homeless voices will be speaking out in the annual Homelessness Marathon January 19th (http://news.homelessnessmarathon.org/ ). For those interested in reading the (partial) Homeless Death toll in Santa Cruz over the years, go to https://www.indybay.org/newsitems/2016/12/20/18794863.php?show_comments=1#18795041 . The Kraemer Place plan was always driven by supervisorial ego and public relations – not practicality. Everybody was emotionally invested in the big expenditure on a permanent building. The more it cost the better the County liked it. That $10,000,000 could have been invested in rapid solutions to the most pressing problems. It’s not even in the right place. So it will need a whole new transportation apparatus. P.S. it’s not being “fast-tracked.” That’s govspeak. It was already (predictably) behind schedule so they are adding a quicker, sleep on the floor option. Rare L.A. Victory for Direct Action Protester ! NOTES BY NORSE: Hats off to long-time Venice advocate David Busch, who’s been fighting city attacks on the local homeless community for decades. See “The Right to Discriminate” at http://www.huffsantacruz.org/StreetSpiritSantaCruz/2002-4-the-right-to-discriminate-001.jpg , http://www.huffsantacruz.org/StreetSpiritSantaCruz/2002-4-the-right-to-discriminate-002.jpg , & http://www.huffsantacruz.org/StreetSpiritSantaCruz/2002-4-the-right-to-discriminate-003.jpg . Santa Cruz’s Parks and Recreation Department and the SCPO have long proclaimed its right to dumpster and destroy homeless survival gear and has lately been doing that, according to participants in the 54-week long Tuesday night Freedom SleepOut’s at City Hall. Retrieval of homeless property (in those instances where it is saved rather than trashed) can only be done during a two hour period (12:30 – 2:30 PM) on Tuesdays and Thursdays in spite of bloated police budget. Parks and Rec thugs-in-white now regularly “patrol” the Downtown Area in white shirts (no white hoods yet)in search of performers, vendors, and activists who are sitting outside the scattered blue and brass boxes (Performance Pens) being used to constrict, coral, and discourage non-commercial activity on Pacific Avenue, the Wharf, and elsewhere. 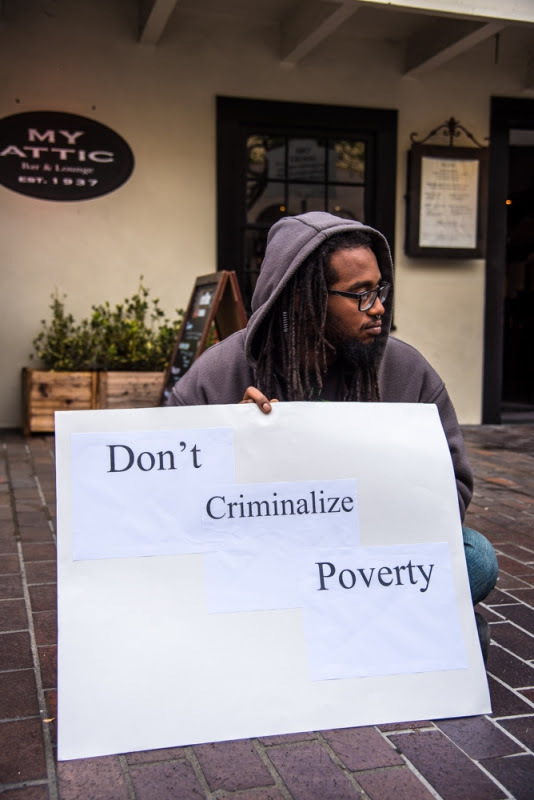 SCPD’s Officer Hoppe has reportedly been jailing impoverished homeless panhandler for peacefully holding up a “help me” sign on the median at Ocean and Water streets. Undefeated visual artists Alex Skelton and Joff Jones face hundreds of dollars in fines in court next month after five in-custody arrests for displaying their paintings on Pacific Avenue “outside the boxes”. Meanwhile fascist-friend City art critics have driven away handicraft artists on Pacific with new laws banning creation, display, or sale of any artwork or perfomance that may have “a functional use” such as jewelry, t-shirts, massage, crystals, etc. Laws banning RV’s from parking late at night anywhere in the city await likely Coastal Commission approval–with homeless people explicitly denied the right to purchase permits. 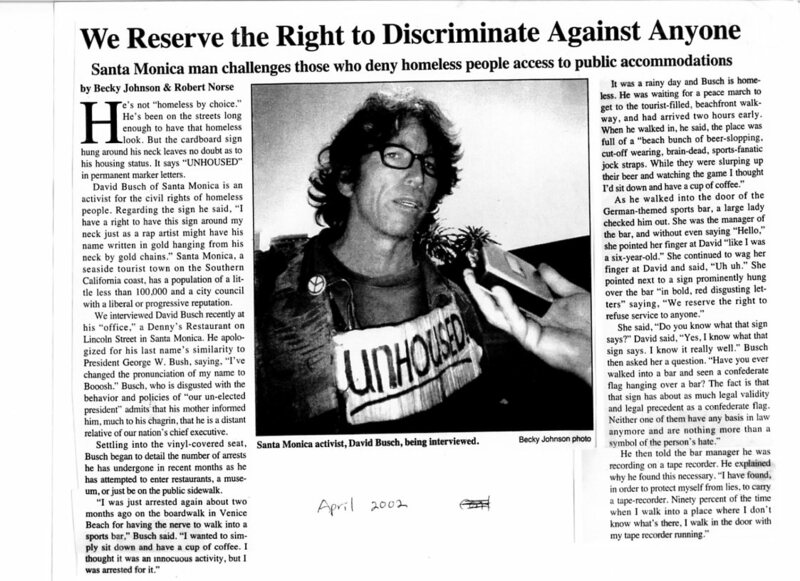 The impending closure of the Homeless Services Center, due to the withdrawal of State administered federal emergency funds, will deprive the homeless of Santa Cruz their basic human rights. The United States is not a poor, developing country, but the self-avowed richest nation on Earth. It is deemed exceptional and indispensable by our leaders. but it can’t supply necessary, minimal services such as shelter, meals, showers, toilet facilities and a secure place to store personal belongings and receive mail, to its most disadvantaged citizens, as mandated by Article 25 of the Universal Declaration of Human Rights, a founding document of the UN to which the United States is a signatory. As such, the City of Santa Cruz is in gross violation of the basic human rights of its citizens. In a civilized society an injury against one is an injury against all. Human Rights Under Attack in the City of Santa Cruz. The impending closure of the Homeless Services Center (HSC), due to the withdrawal of State administered federal emergency funds, will deprive the homeless of Santa Cruz their basic human rights. Article 25 of the Universal Declaration of Human Rights, a founding document of the UN to which the United States is a signatory, states unequivocally that, “Everyone has the right to a standard of living adequate for the health and well-being of himself and of his family, including food, clothing, housing and medical care and necessary social services, and the right to security in the event of unemployment, sickness, disability, widowhood, old age or other lack of livelihood in circumstances beyond his control.” The United States is not a poor, developing country, but the self-avowed richest nation on Earth. It is deemed exceptional and indispensable by our leaders, but it can’t supply necessary, minimal services such as shelter, meals, showers, toilet facilities and a secure place to store personal belongings and receive mail, to its most disadvantaged citizens. While the HSC has been providing basic humans services to its clientele since 1986 it is still far from adequate and many people are turned away or otherwise go unserved. The recent denial of emergency funding to the tune of $350,00 and increases in insurance premiums and other expenses have resulted in the HSC running a structural deficit of $600,000 or approximately 18% of its $3.4 million dollar 2015 budget (http://www.santacruzsentinel.com/social-affairs/20150526/santa-cruz-homeless-services-facing-cuts ). This shortfall is being used as an excuse to curtail all essential services to the homeless, resulting in the locking of the HSC gates as of July 1, 2015. But in 2012 with revenues of $2,114,000 and expenses of $2,538,000 the HSC was able to continue functioning with a $423,000 structural deficit or a 20% shortfall. Thus the loss of some funding in 2015 ($350,000 or about 10% of the overall budget) and other increased expenses should not of necessity entail the denial of basic human rights to a significant portion of the population of Santa Cruz. This is especially the case when funds are readily available from the City for a $420,000 increase in monies allocated for “economic development” (City Budget page 248) and while over 100 city bureaucrats and functionaries make more than $200,000 in total annual pay and benefits (http://transparentcalifornia.com/salaries/santa-cruz/?page=3&s=-total). The assault on human rights in Santa Cruz, however, is apparently not happening in Monterey or Salinas that are said to have received similar cuts in emergency federal funding. 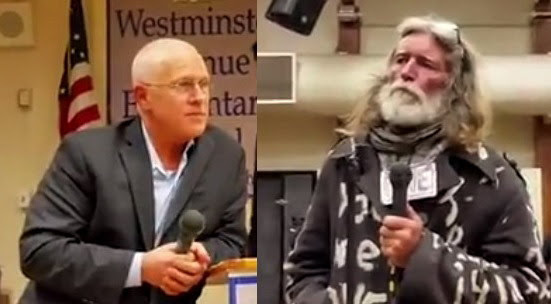 Recent news stories from Monterey for instance report that the City Council has voted an additional $500,000 for homeless services (http://www.montereyherald.com/social-affairs/20150520/monterey-approves-500k-homeless-spending-plan), especially targeting homeless youth, veterans and women (http://www.montereyherald.com/social-affairs/20150527/advocate-community-has-resources-to-help-monterey-homeless-women). Meanwhile, the Salinas City Council apparently has the the discretion to disburse federal funds as they see fit. According to the Californian “The Salinas City Council voted unanimously Tuesday to disburse a little more than $2.6 million in federal Department of Housing and Urban Development funding. The money is distributed to American cities annually in three main ways — through the Community Development Block Grant program, the HOME investment partnerships program and the Emergency Solutions Grant (ESG) program — the latter of which primarily addresses homelessness. This year, on staff’s recommendations, the council voted to spend $1.9 million on CDBG programs, $543,083 on the HOME program and $172,842 on the ESG program.” (http://www.thecalifornian.com/story/news/2015/05/13/council-doles-million-federal-hud-money/27221591/). If Salinas has the ability to allocate federal Department of Housing and Urban Development funds why not Santa Cruz? Santa Cruz likes to portray itself as an affluent, progressive California city. But nearly 22% of the population of Santa Cruz lives below the poverty line (http://quickfacts.census.gov/qfd/states/06/0669112.html) (http://www.city-data.com/poverty/poverty-Santa-Cruz-California.html), and most of the 41% who rent cannot afford the sky high prices for even modest accommodations and have to live hand to mouth just to make ends meet (http://www.cityonahillpress.com/2015/06/09/inching-up-and-crowded-out/). Santa Cruz is statistically one of the poorest cities of its size in all of California (http://www.santacruzsentinel.com/general-news/20110922/santa-cruz-county-poverty-rate-highest-among-bay-area-counties). So while the majority of Santa Cruz residents struggle to survive and while City workers are denied a living wage (http://www.santacruzsentinel.com/government-and-politics/20150527/santa-cruz-city-labor-workers-take-over-budget-meeting), City bureaucrats get fat at the public trough. Whose interest does the City serve when its policy makers earn incomes that dwarf that of most Santa Cruz residents? Who do they hobnob and identify with, the poor and downtrodden on our city streets, the working poor servicing the restaurants they eat at and the struggling working (former middle) class who spend their meager paychecks at local businesses or the wealthiest stratum of Santa Cruz society? Who do they serve? Need I ask? It’s interesting to have various financial data side-by-side with things you’re just imagining. This is the sort of stuff that TBSC did two years ago as they made wild assumptions about the intentions of the center. The weeks since the news of funding cuts have shown that lefties are no more investigative or compassionate as those who hate people experiencing homelessness. As people face sleeping outside, you attack the system (though in error). We’ve seen the lack of real care and compassion as this whole thing is being as a device to complain about HSC, and the City without ever taking any responsibility yourself. Perhaps “same stupid foot” can identify the particular “wild assumptions” and attacks Etler makes in the article. Mindless support of bad behavior by the Homeless (Lack of) Services Center [HLOSC] is as bad as mindless opposition a la TBSC. These behaviors include silence as more laws are being passed criminalizing the homeless, refusal to provide the documentation needed to deter Sleeping Ban citations, failure to provide obvious direct services (lockers, adequate shelter), prison-like conditions (locked gate, fence, ID card), and closed bathroom at night. It’s also telling that the HLOSC has declined repeatedly to make its budget for this year and last year public in spite of repeated requests. And significant that apparently they move immediately to announce cut off of the most essential emergency services [shelter, food, bathrooms, laundry, mail] when only 10% of their budget has been cut and 90% remains. It appears that HLOSC is colluding with an agenda to reduce or eliminate emergency services. Perhaps this is being done to follow the federal money, perhaps to deter TBSC criticism, or perhaps simply as a wake up call to encourage more donors [this is the most hopeful prospect–if you’re a balls-out supporter of the HLOSC). In any case, community support for meals, shelter, and other essential services–in whatever form–must be mobilized. Come to the Thursday June 11th meal tomorrow at 10 AM at Hiway 1 and Hiway 9. Support real alternatives to police harassment that will face more homeless people on June 29th. Folks can ask McKittridge herself what’s cooking at smckittrick [at] santacruzhsc.org or call her at her office 831-458-6020 ext. 3110 or on her cell at 831-345-5998 . 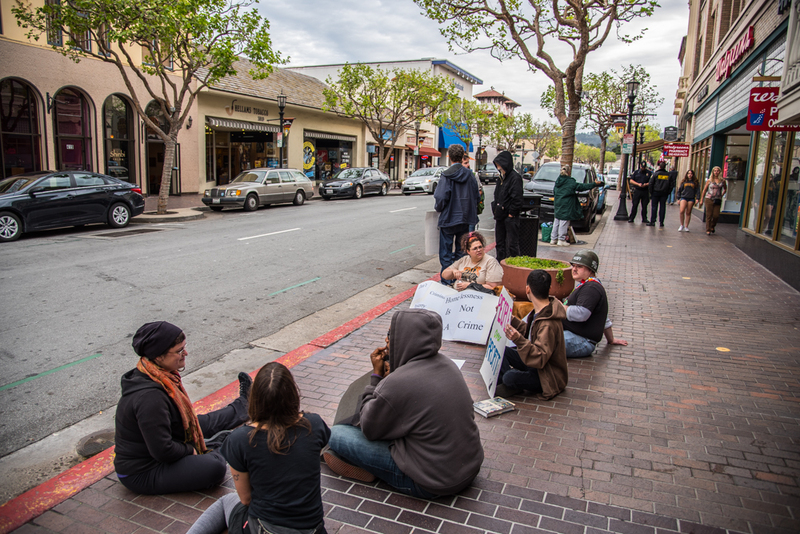 Monterey Police have portrayed their enforcement of the city’s sit-lie ban as a friendly process where first-time violators are simply given a “warning” when found sitting or lying on sidewalks located downtown and in other commercial districts. 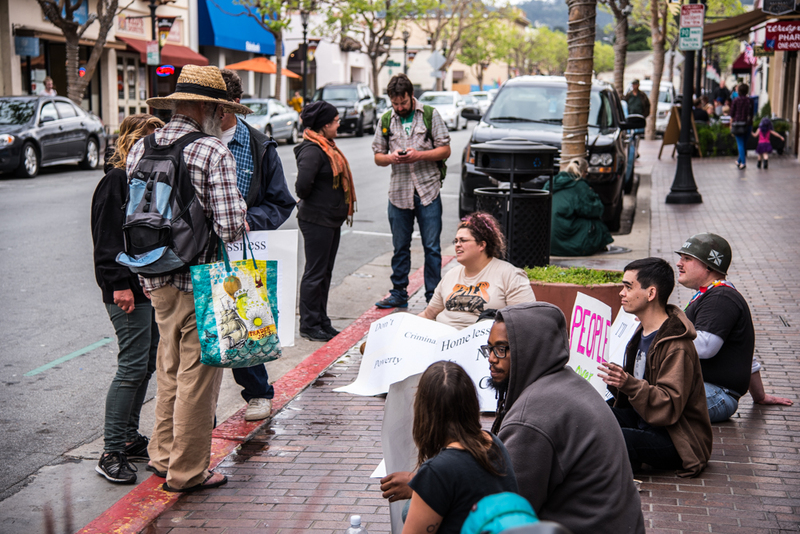 On May 1, community members participating in a sit-in held on the sidewalk of Alvarado Street to protest the new law demonstrated the process isn’t quite that simple. More than a dozen individuals were confronted by police and forced to give them their name, date of birth, and home address as part of the verbal warning that they were in violation of the site-lie ordinance. For the past several months, community members have been organizing sit-ins to oppose the ban, which they say unfairly targets homeless people and travelers. As the warnings were being issued, a few individuals joined the group and sat down right in front of police. Some did comply with the warning and stood up during the encounter, but the majority continued to sit. Three police officers were deployed to the scene; two issued the warnings while Sergeant Bob Guinvarch photographed several people and looked on. Officer Roobash instructed individuals several times they shouldn’t be opposing the ordinance by openly defying it. “You need to take this to the City Council and proper channels,” he said. He asked if any of them had written the city to complain, and several demonstrators explained they had been contacting local officials since 2013 when the Monterey City Council initially discussed the matter and decided not to move forward with a sit-lie ban at that time. The council reversed course in 2014, however, and enacted a re-submitted proposal for a sit-lie ordinance. There was some irony in Roobash, a police officer, instructing demonstrators to complain to the city. It was Monterey Chief of Police Phil Penko who pushed hard for a sit-lie ban, and he authored the 2013 and 2014 city staff reports that requested council members approve one without any alternatives presented. Additionally, Monterey Police have dedicated an entire section of their website, which is titled “Homeless Issues,” to give business owners and the public instructions on how to report homeless people to the police. “The following information is provided to assist business people and individual community members in properly addressing incidents and concerns regarding the homeless and related quality of life issues,” the Monterey Police website states. Another demonstrator told police that he was a “homeless man” and he felt “extremely offended” that officers were attempting to prevent him from sitting on the sidewalk. He explained later how he uses alcohol to cope with life on the streets, which puts him at risk of violating the sit-lie law, and being targeted by police. “I drink myself to sleep every night,” he said…..[story with more photos continues at https://www.indybay.org/newsitems/2015/05/08/18772076.php . Later on Friday two HUFF activists supported the right to assemble at Elm and Cedar (near or across the street from the Cafe Pergolesi) which police and security guards have been regularly attacking with false “obstructing the sidewalk” threats and tickets. The activist weapon: prominently displayed video equipment. Apparently the presence of folks and recording does make a difference. Officer Winston, reported hung out for half an hour, but didn’t demand youth gathering there move on–as police and security guards have been doing with regularity. You have a “right to stand” on the sidewalk if you move out of the way for passersby when requested to do so. Even if you’re young, homeless, or a traveler with a backpack. Ironically, it is illegal to sit down on the same sidewalks (on Elm St. or along the Pergolesi side of Cedar St.) as well as anywhere in the Elm and Cedar City parking lot (even in your own vehicle, legally parked). 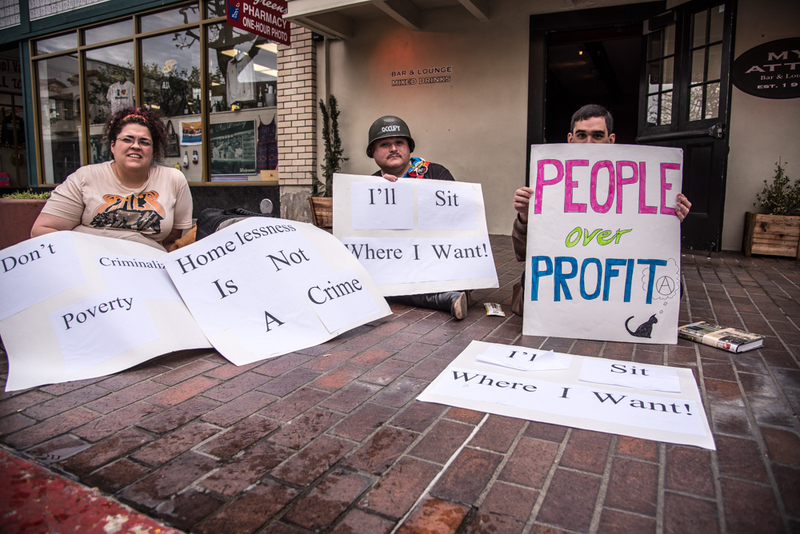 As it has expanded the mini-police state for homeless people, the Santa Cruz “no sitting” law (MC 9.50.012) is much harsher than the Monterey law and has been on the books for more than two decades now (and reduced legal sitting space downtown to less than 1% of the sidewalks). Though free-standing commercial signs in front of businesses are blatantly illegal, no store owner or manager has, to my knowledge been fined or otherwise sanctioned. One possible strategy for the bold: If you’re being harassed for sitting down on the sidewalk on or near Pacific Avenue–or see it happening to someone else–request the cop issue a citation. To the nearest business hosting an illegal free-standing sign on the sidewalk in violation of city law. There’s at least one on every block. Video or audio recording would help, but a witness is also okay. 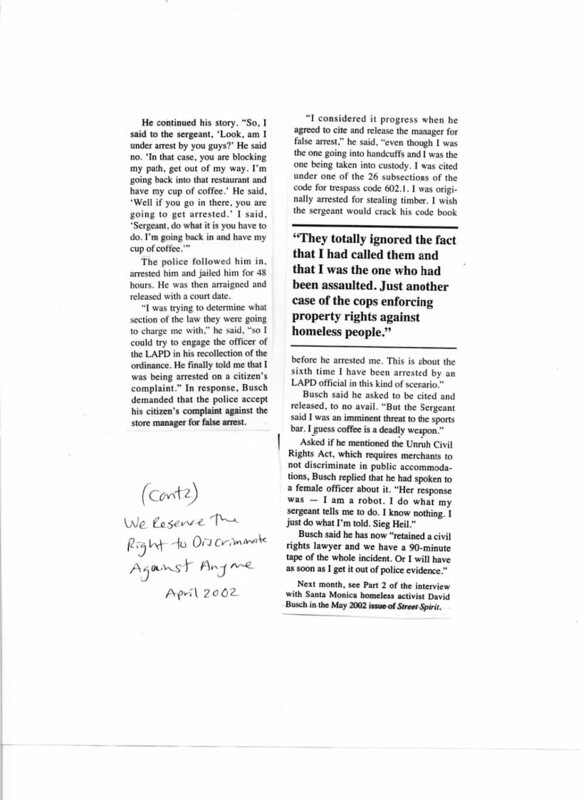 If–as is most likely–the cop declines to issue the citation, note his name and badge number, the time, sign location, and name and address of the criminal shop. File a complaint with both the SCPD and the City Manager, and post it on indybay. Ask to speak to the cop’s superior if he refuses to be helpful. Document it as you go. In this video Luke Rudkowski is in Venice Beach California investigating the recent death of Brendon Glenn aka drizzle. Brendon was an 29 year old homeless man who was unarmed during the altercation with police. LAPD shot him two times and took his life. The man, identified as Brendon Glenn, was described as a black male in his mid-to-late 20s. The officer who shot the suspect is also black, LAPD Cmdr. Andrew Smith said. The shooting occurred near Pacific and Winward avenues around 11:30 p.m. Tuesday just a block or so away from the beach. Two LAPD officers responded to the scene after people called police saying a man was causing a disturbance outside of a bar. Friends of the suspect say he was panhandling, but police said he was disturbing the peace. After officers spoke with the suspect, he walked away in the direction of the boardwalk. A short time later, the officers “observed the suspect physically struggling with an individual on the sidewalk west of their initial location,” LAPD said in a statement. The responding officers made contact with the suspect, and at some point, there was a struggle between the man and the two officers. That’s when the shots were fired. The officer who shot the suspect, described by police as a veteran of the force, was on crutches after injuring his knee during the incident. “Clap, clap, and I was like, ‘What was that?’ And all I see is this dude fall to the ground,” described Dylan Andre, a witness. Andre was standing near the scene of the shooting, but he said he never heard or saw any scuffle before hearing the gunshots. “When I heard the clap, it sounded like it came from far left, but it was right in front of me,” Andres said. William Henson, a friend of the suspect, said the man was still alive and asking for help after he was shot. The suspect was transported to an area hospital, where he was pronounced dead shortly after midnight. Henson described the man as a lost soul. “He was a recovering crackhead for 13 years, came out here, got real bad on alcohol, but if he wasn’t on alcohol, he was OK,” Henson said. Don Wige, who lives on the streets, also knew the suspect. “He had a lot of anxiety inside of him and frustration. He couldn’t understand why the world was so negative,” Wige said, adding that the suspect’s size and strength could easily look threatening. LAPD Officer Meghan Aguilar said police protocol is to use the least amount of force necessary to control the situation. She said she doesn’t know why a Taser was not used in the incident. “That will be something that force investigation division does ask the officers. They will ask them why they chose to use the force they did and why they didn’t choose to use the force that they did not use,” Aguilar said. The two officers involved in the shooting were not wearing body cameras, and there was no dash camera on their vehicle. However, police said they will retrieve surveillance video from the surrounding area that they believe captured the shooting. LAPD Chief Charlie Beck spoke at a news conference held Wednesday afternoon and said surveillance video shows the officer and suspect in a scuffle. He also said the department will thoroughly investigate the situation. “Anytime an unarmed person is shot by a Los Angeles police officer it takes extraordinary circumstances to justify that, and I have not seen those extraordinary circumstances at this point,” he said. The injured officer is on medication and has yet to be interviewed by investigators about the shooting, Beck said. Both officers involved in the shooting have been taken off the street and will remain off patrol pending the outcome of the investigation. Authorities said a suspect weapon was not found at the scene. The shooting remains under investigation. Beck said a town hall meeting is scheduled at the Pacific Division Station involving the LAPD and political leaders on Thursday. LAPD Chief Charlie Beck on Wednesday addressed the death of an unarmed homeless man fatally shot by an officer following a confrontation near the historic Venice sign, saying the shooting concerned him and an investigation was underway. Brendon Glenn, 29, was the individual killed by police late Tuesday night, according to a man who runs the Teen Project’s drop-in center for homeless youth in Venice. Beck said in a Wednesday afternoon news conference that he had reviewed video of the shooting and he did not see evidence that indicated extreme circumstances that could prompt an officer to open fire. “Any time an unarmed person is shot by a Los Angeles police officer, it takes extraordinary circumstances to justify that, and I have not seen those extraordinary circumstances at this point,” Beck said. Both the male officer who opened fire and the man killed were black, the chief noted. The incident began about 11:20 p.m. Tuesday when someone called police to report a man harassing customers and refusing to leave near Pacific and Windward avenues (map), Beck said. The location is about a block away from Venice Beach and in front of several bars and restaurants. The man, described as a transient, had been involved in an altercation with a bouncer at a nearby bar prior to police being called, LAPD Detective Meghan Aguilar initially said Wednesday morning. Police were called with a report of a man “disturbing the peace” and “harassing passersby,” she said. Brendon Glenn, fatally shot by LAPD on May 5, 2015, in Venice, is shown in a photo provided to KTLA. Officers spoke with the man, who then walked away toward the boardwalk, Beck said. Soon after, officers saw the man approach an individual and start a fight, the chief said. “The officers attempted to detain the suspect, and an altercation occurred between the two officers and the suspect. During that physical altercation, an officer-involved shooting occurred,” Beck said. Officers called for a rescue ambulance and began to perform CPR; city firefighters responded and took the man to a hospital, where he died, according to the chief. A friend who knew Glenn said he didn’t deserve his fate. Another friend, Shane Brigham, described Glenn as “a really big hugger,” who always checked to make sure everyone around him was alright. Glenn was a regular the Teen Project’s the P.A.D., a Venice support center for homeless youth, according to Timothy Pardue, who runs the center. Glenn, who had recently moved to the area from New York, had come to a support group meeting on Tuesday night, Pardue said. As of Wednesday evening, the coroner’s office had not confirmed the fatally shot man’s identity. Beck said the man’s identity was not being released pending family notification. During the struggle that led to the shooting, one of the LAPD officers was injured and later treated for a hurt knee, Aguilar said. The injured officer, who was the open who opened fire, was on medication and had not been questioned because the medication could interfere with a “fair” interview, Beck said. He noted that the delay was unusual. As the investigation into the incident continued, the intersection of Pacific and Windward was cordoned off and closed to motorists. Investigators were trying to obtain surveillance video from businesses, police said. Neither officer involved was wearing a body camera, Aguilar said, noting that the camera program had not yet been expanded to include all officers. Both officers involved in the shooting were assigned nonfield duties during the ongoing investigation, Beck said. The police officers’ union president said Beck’s statements would unduly influence the investigation. A “town hall” meeting was set to be held Thursday in connection with the shooting, according to the chief. Los Angeles Police Chief Charlie Beck said Wednesday he has yet to see evidence that would justify one of his officers killing an unarmed homeless man in Venice Beach Tuesday. Beck cautioned that his department’s investigation was just underway but told reporters he was ‘very concerned’ by the deadly shooting that occurred as an officer struggled with the man on a block lined with bars and restaurants. ‘Any time an unarmed person is shot by a Los Angeles police officer, it takes extraordinary circumstances to justify that, and I have not seen those extraordinary circumstances at this point,’ Beck said. Department investigators have not interviewed the officer, a veteran of the LAPD, because he is on medication to treat a knee he hurt during the struggle. He was observed at the crime scene Wednesday walking on crutches. The officers were not wearing body cameras, but police have surveillance footage from nearby stores that shows the altercation, Beck said. The confrontation began at 11.30pm at Pacific and Winward avenues when two officers responded to a 911 call saying the man, an African-American vagrant in his 20s, had been arguing with a bouncer who would not let him into the popular Townhouse & Del Monte Speakeasy bar and was pestering passersby, police said. The officers spoke to the man, identified by an acquaintance as 29-year-old Brendon Glenn, who began walking away but then came back and began struggling with someone on the sidewalk, according to a police news release. The officers tried to detain Glenn, who was shot during the struggle, police said. The cops called for an ambulance and then began performing CPR to revive the suspect. The 29-year-old was rushed to an area hospital, where he died from his wounds a short time later. No weapon was recovered at the scene, police spokeswoman Liliana Preciado said. William Henson, a friend of the slain vagrant known to his friends as ‘Dizzle,’ said he was a recovering crack-cocaine addict and alcoholic. Don Wige, who also lives on the streets of Venice Beach, told the station KABC the officers may have been threatened by his friend’s size and physical strength. On Wednesday, a small crowd of people shouted at police in Venice Beach. Beck later noted that the officer and Brendon Glenn were black. ‘Even if race is a small part of this, which I don’t think it is, they’re certainly outweighed by the mental health issues, the homeless issues, the alcohol issues,’ Beck said. Those who knew Glenn said he had moved to LA from New York City only a couple of months ago and had been struggling to find a job. Timothy Pardue, who runs a local center that provides assistance to homeless youth, told KTLA that Glenn was one of his regulars. Pardue said Glenn showed up at Teen Project’s PAD center Tuesday night, just hours before his death; he was crying and lamenting that his mother would not let him come home. Glenn’s many acquaintances among Venice Beach’s large transient community told the LA Times that the recent East Coast transplant had an aggressive – even mean – side to him, but he also had been known to hug people and tell them he loved them. The LA police department will hold a ‘town hall’-style meeting in the neighborhood Thursday to address the shooting. The department was criticized after an officer fatally shot a homeless man in March on Skid Row, near downtown LA. Neither police nor the coroner’s office had confirmed the dead man’s identity, though Preciado said a 911 caller and several witnesses identified him as one of the Venice area’s many transients. At Thursday’s LAPD community meeting in Venice following the fatal shooting of unarmed 29-year-old Brendon Glenn, also known to friends and the Rainbow Family as Dizzle, community members took the microphone for public comment. NOTE BY NORSE: Palo Alto activist and vandweller Chuck Jagoda has forwarded this alert from Sandy Perry of CHAM, San Jose’s Community Homeless Alliance Ministry. Note that the homeless woman is still unnamed, nor do we hear the names of those responsible. An activist called me to say that earlier KGO reported this as a CalTrans incident that put the woman in the hospital. HUFF will be serving food and coffee at 9:30 AM in front of the Main library Tuesday March 31st to continue gathering reports of the abusive ticketing of homeless people trying to sleep at night. We will also be monitoring the activities of abusive First Alarm personnel, such as “Big John”–a beefy guy who reportedly has elevated harassing homeless people in the library to a regular practice if not a sadistic art. Parks and Rec Czarina Dannettee Shoemaker told me at a P & R “public input” session on how to address parks in the general plan that she would not be able to support a permit for homeless people camping in the parks–as sought by activist Phil Posner for his Camp of Last Resort in spite of the hundreds of acres of open space available, particularly in the Pogonip. Previous reports by writer and politico Steve Pleich had indicated she “hasn’t said ‘no’”. Please pass on any reports of stay-away orders issued since mid-February of this year, particularly those for longer than one day as well as abusive behavior by First Alarm security guards. We are also urging people to file claims against the City every time they get a Sleeping Ban, Blanket Ban, or camping citation. Pleich and lawyer Judi Bari intend to apply for a restraining order against the law on April 20th. Right 2 Rest supporters of legislation at the state level will be going to hearings in state legislative committees this month. Contact HUFF for more information. (KGO) – Officials say that a homeless woman was injured after getting run over by a CHP tractor that was working to clear out a homeless encampment in San Jose. The CHP reports that a loader-tractor was clearing a homeless encampment on Story Road at about 10 a.m. today when the accident occurred. The loader was tearing down a tent when someone warned the operator that there was a person still inside the tent. Officials say the woman suffered minor injuries, and she was treated at the scene. Caltrans was bulldozing her tent in a “clean-up” near Story Road. additional estimated 270 homeless out onto the streets. Highway, then to Almaden Road, and they are still moving. housing for the homeless and for all people in need in Silicon Valley. campgrounds with appropriate sanitary facilities and trash disposal. 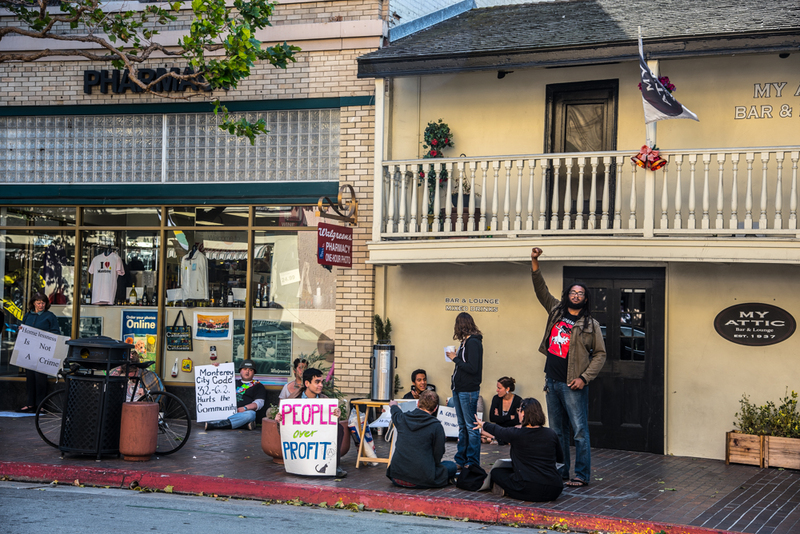 Individuals with Direct Action Monterey Network (DAMN) and other community members returned to Alvarado Street in Monterey on March 13 for a second sit-in. They are protesting a law that went into effect in October that makes sitting or lying on commercial sidewalks a crime from 7am until 9pm. DAMN’s first demonstration against the sitting ban was held on February 13, exactly one month prior, and they say they plan to return again next month for a similar action. The idea to schedule the protests monthly was a calculated decision. The phrasing of the new law states that if an individual receives a warning from the police to stop sitting, they must not sit on the sidewalk again for one month, or they can be cited and or arrested. “Join us as we sit and lie in solidarity with the homeless, travelers, and all people targeted by police and their brutality,” an announcement for the March 13 event read. DAMN members are not using the word “brutality” lightly. As recently as two months ago they received a first hand account of police officers in Monterey physically beating a homeless person who had been lying on Alvarado Street’s sidewalk. A few minutes later Jason Coniglio, the owner of My Attic Bar & Lounge, asked them if they weren’t unfairly targeting his business, since they had already demonstrated in front of it once before. One of the demonstrators then asked him if he had spoken out against the sit-lie law, and Coniglio did not respond. Another downtown business owner spent a good deal of time sharing his list of complaints about street people with the group of demonstrators. One of his claims was that over the years he had offered jobs to a number of different people who he had seen panhandling, and none had ever taken him up on the offer of work. In May of 2013, when the Monterey City Council was first considering a sit-lie ban, Monterey Chief of Police Philip J. Penko authored the staff report that explained a sit-lie ban proposal was brought to them because for several months city staff had received complaints about “a decreased sense of safeness” in downtown Monterey, around Fisherman’s Wharf, and long Roberts Road and Garden Road. Fred Meurer, who was City Manager at the time, told council members that the bulk of complaints came from the Old Monterey Business Association membership. The council decided at that time not to study the concept further, but increased pressure from the business community and the police led to a sit-lie ordinance being passed in 2014. During DAMN’s first sit-lie protest on February 13, there was a strong police presence on foot monitoring the group’s activities, but not so for the second protest, and so far no one has been warned by police to stop sitting at the demonstrations. The next sit-in is planned for April. Note by Norse: Berkeley has long held off the worst anti-homeless ordinances. Far worse laws are entrenched in Santa Cruz since 1994 and have gotten exponentially worse. Our latest obscenity is the Stay-Away-at-a-Policeman’s-Whim law which allows cops and rangers to issue their own stay-away laws once they’ve given out any kind of infraction ticket with no judicial oversight. Already hundreds of such orders have been issued (on pain of a year in jail) and as of mid-February the length of banishment has been increased for up to a year. Why such a discrepancy between Berkeley and Santa Cruz? Both are university towns with liberal reputations,. Berkeley is bigger and lies in a larger urban area where activists can more easily congregate to oppose the reactionary riptide. Berkeley also seems to be able to enlist–at least in part–many social workers and service providers, who remain starkly silent in Santa Cruz as nasty law after law is proposed and passed. Activists in Berkeley hit the streets and demand real local police reform instead of largely limiting their concerns to symbolic targets like the BearCat armored personnel carrier, license recognition software, or “protection” from the NDAA. The most recent liberal coalition of organizations appearing faithfully at City Council to speak out against the BearCat have banned HUFF from their literature in a closed meeting without discussion, appeal, or notice. Those interested in a possible caravan up to Berkeley on Tuesday March 17th, contact HUFF at 423-HUFF (4833). I hope to be heading that way with at least one vehicle. 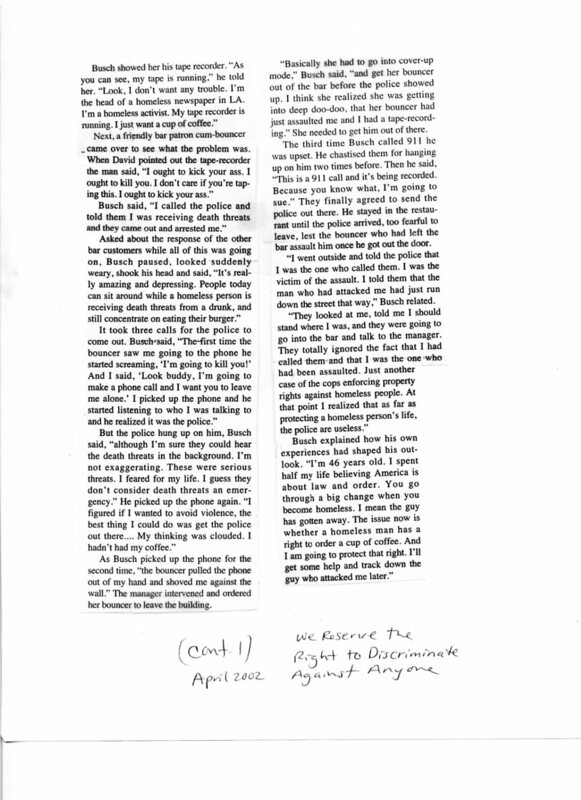 I’ll be hoping to interview someone from Berkeley on this issue tomorrow on Free Radio Santa Cruz at www.freakradio.org sometime between 9:30 AM and 1 PM. Check the links in the three stories below to catch more photos, comments, and video. 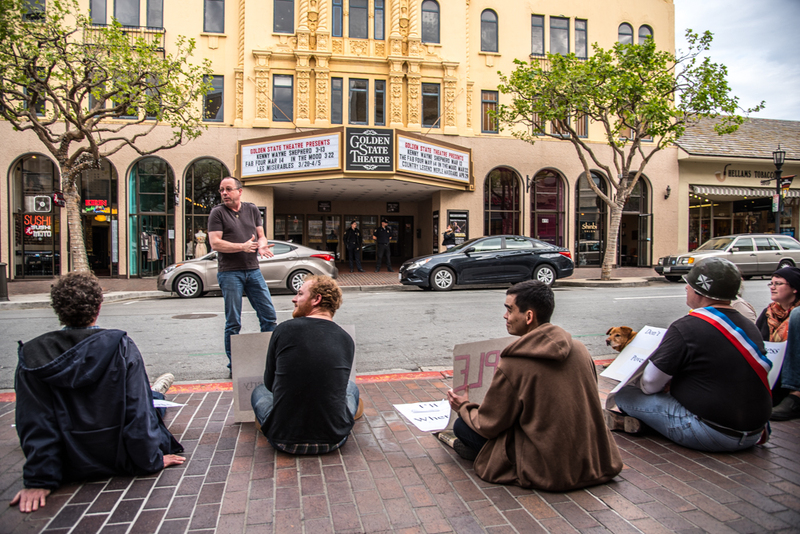 The Streets Are for Everyone Coalition (SAFE), is calling for an emergency march and rally on March 17 to protest efforts to get the Berkeley City Council to pass new laws targeting homeless people on the streets of the city. The protest will precede a meeting of the Council at which it will consider a proposal by Councilmember Linda Maio for a raft of new ordinances, which would criminalize such innocuous activities as “lying on planter walls” and “deployment” of bedding on sidewalks and plazas during the day. The march will begin at 5 PM on the corner of Telegraph Ave. and Haste Street and proceed to the steps of Old City Hall at 2134 Martin Luther King Jr. Way, for a rally at 6 PM. BERKELEY — Advocates for the homeless are protesting a new set of rules, proposed by Councilwoman Linda Maio, that they say would criminalize much of what homeless people do to survive. Maio, whose northwest Berkeley district includes the commercially booming Gilman Street corridor, proposes several ordinances to regulate a slew of activities in commercial areas, ranging from cooking, panhandling and storing possessions, to urinating and defecating. 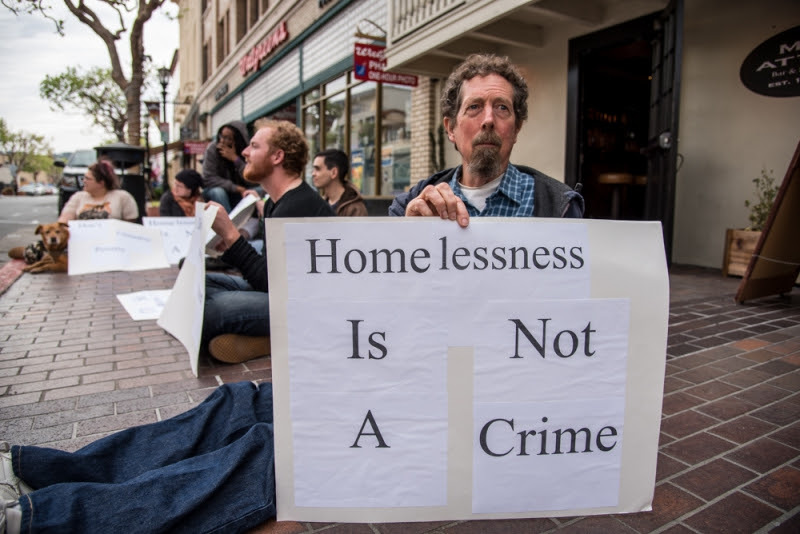 “Taken together with existing laws, these ordinances would essentially make it illegal for people who are homeless to have a presence on our streets and sidewalks,” Osha Neumann, an attorney with the East Bay Community Law Center, said in a news release from the SAFE (Streets Are For Everyone) coalition. The group has called a protest march and rally before Tuesday’s City Council meeting. Maio says she seeks “consistency in the enforcement of current ordinances,” to protect public infrastructure, facilitate maintenance, promote cleanliness and safeguard public access, among other goals. She also wants a review of ordinances in other cities that address public urination and defecation and to ensure that public restrooms are available and well publicized, in collaboration with BART. a six-foot right of way is adequate for pedestrian and wheelchair passage in high-traffic areas; and explore extending transition-aged youth shelter hours beyond winter months. The regular council meeting will begin at 7 p.m. in the Old City Hall at 2134 Martin Luther King Jr. Way. The march will begin at 5 p.m. at Telegraph Avenue and Haste Street and will proceed to Old City Hall for a rally at 6 p.m., according to the SAFE news release. On March 17th the Berkeley City Council will consider expanding the authority and practice of police, especially in downtown Berkeley. The council will consider authorizing the police to treat the down and out even more harshly than they are already treated. Jesse Arreguin and Linda Maio have brought this authoritarian measure before council. “1. Ordinance preventing panhandling within 10 feet of a parking pay station (akin to our ATM ordinance). “2. Review ordinances other cities use to address public urination/defecation and return with recommendations for implementation; ensure public restrooms are available and well publicized. Involve BART in exploring possible locations. “3. Ordinance preventing the placement of personal objects in planters, tree wells, or within 3 feet of a tree well. “4. Ordinance preventing lying on planter walls or inside of planters. “5. Ordinance preventing deployment of bedding, tenting, sleeping pads, mattresses, blankets, etc. on sidewalks and plazas from 7 a.m. to 10 p.m.
“6. Ordinance preventing personal items from being affixed to public fixtures including poles, bike racks (except bikes), planters, trees, tree guards, newspaper racks, parking meters and pay stations. Pet leashes exempt only as not prohibited in BMC 10.12.110. “7. Ordinance preventing unpermitted cooking on public sidewalks. “8. Survey business districts to determine adequacy of enforcement of current ordinances; develop an action plan for consistent enforcement as needed. “9. Clarify if “no trespass” signs on private property extend to sitting against buildings. “10.Assess adequacy of six-foot right-of-way to enable sufficient pedestrian and wheelchair passage particularly in high-traffic areas. To that list we might add an item carried over from March 10th: Jesse Arreguin’s proposal to compete against panhandlers with donation boxes downtown, branded “positive change”. These new boxes would turn over donations to city bureaucracy, either directly or in the form of the Downtown Berkeley Association. The middle class will take a large cut of handouts meant for the very poor. Quite simply, Jesse Arreguin and Linda Maio are launching a doubling down on the police attack on the down and out. Our supposedly progressive District 4 councilman, the supposed inheritor of Dona Spring’s legacy, has joined with those who want to bum rush the poor and the crazy out of town, by means of police and court system violence. Nobody likes being panhandled but proximity to a parking pay station has nothing to do with it. “10 feet from a parking pay station” is a feeble excuse to write tickets, to send random-down-and-out people to jail, to enrich the police forces, and to pretend for the sake of effete snobs that at long last Something Is Being Done. And what of “personal objects in planters, tree wells, or within 3 feet of a tree well”? Here, Jesse and Linda propose to penalize poor people for owning a few things, and setting them down where they are out of the way. What of an ordinance preventing stretching out on a planter wall, an architectural feature perfect for relaxing in public while not spending money for the benefit of local landlords? Jesse Arreguin and Linda Maio have taken the view that if you aren’t giving money to Berkeley’s landlords then you have little business downtown and should certainly not try to make yourself comfortable or set anything down. The measure goes on like this and only hypocrites and liars can find in this sorry excuse for legislation anything much more than an attempt to respond to a humanitarian crisis by penalizing the victims further. Linda Maio once declared that she trembled with rage on the dais at the assertion she was less than a progressive. For reasons that are hard to imagine, Jesse Arreguin is still presumed a progressive. Nobody particularly enjoys an overly aggressive panhandler. Nobody thrills to the “fun” of encountering a homeless mentally ill person in mid-crisis. White people don’t like being name called racial names. People of color don’t like being eyed with obvious suspicion and disgust. Poor people don’t like getting brushed off the sidewalk by aggro khaki’ed business bros.
Nobody can stand dumb students who zombie through town deafened by ear buds and tunnel-visioned into their not-so-smart phones. Women righteously resent the cat calls and the “b word”. Yet none of this justifies blue-suited men with guns and restraints violently punching down the most vulnerable. None of this justifies our society’s failure to manage public restrooms and showers and shelter. None of this justifies the equally offensive sneering and snarky behavior of rich theater patrons, ice cream seekers, and khaki-and-hemp swells about town. Expanded police, and jail, and court system violence is not the answer and it will only make matters worse. It is the height of malevolent cynicism that Linda Maio and Jesse Arreguin propose such state sponsored violence as a condition of meager improvements to social spending. There will be protests at the March 17th council meeting and I have no idea if they will be large or small. Regardless, if Berkeley wants to keep going in this direction, our City Council will make Berkeley ground zero for a lasting confrontation. Berkeley will lead the nation, even if the council dais can not. Among many others, a couple of our council people put an item on the Action Calendar and many of us on Berkeley Commissions would not of even had a chance to speak out about it if we hadn’t moved up our monthly meetings to respond to the City Manager on budget issues. The action was hidden behind hundreds of pages of the Berkeley Sewer Plan. Working with HAC, E.B.C.L.C. and others I and my comrades made sure this sneaky move was the top subject at the Symposium. What the council members thought was a very clever ploy turned out to be the worst mistake they ever could of made. Ah to feel young again!!! So give me a ring if you like 510-684-5866 and we can talk.